Polystichum acrostichoides is called the "Christmas fern" because some parts of the plant remain green throughout the year and are thus available for use in decorations at Christmas time. The rich, green leaves (fronds) of the fern are up to three feet long and are about four inches wide. They are tough, leathery and lance-shaped to a pointed tip. 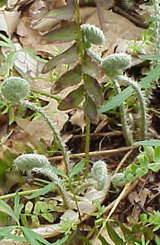 The fronds are attached to a relatively short stalk that is brown at its soil base and green toward its apex. A central, perennial root (the rhizome) supports the stalk that then supports the arching clump of tall fronds. The sterile fronds (fronds not involved in reproduction) are shorter and less well supported than the spore producing fertile fronds. The sterile fronds, then, form an encircling, arching border around the central mass of taller, more erectly held fertile fronds. It is the sterile fronds which remain green throughout the year. Each fertile frond sports 20-40 leaflets, with the sori (clusters of spore-producing sporangia) forming only on the upper third to half of the leaflets. These fertile leaflets are noticeably shorter than the non-sori bearing leaflets, giving the impression of a sudden narrowing of the entire fertile frond toward the top. In a typical fern life cycle, spores are produced within sporangia when moisture and temperature conditions are favorable. In the Christmas fern, spore production occurs between June and October. A small percentage of the released spores from the tall, erectly held fertile fronds will find an optimal microhabitat in the surrounding soil and then be able to grow into the fern's tiny sperm and ova producing life stage called the gametophyte. Fusion of the sperm and ova within the gametophyte will produce a new sporophyte which can then grow into a mature fern. New sporophytes can also arise vegetatively from the perennial rhizome. These coiled young ferns are called fiddleheads (see image at right). Fiddleheads arise in the early to mid-spring. Christmas fern is found in the north-eastern and north-central portions of North America from New Brunswick south to North Carolina. It is especially abundant on well shaded, forested hill sides near streams. Soils of moderate moisture and a more neutral pH are preferred. This pH preference is reflected in the increased densities of Christmas ferns in soils that overlie limestone bedrock. 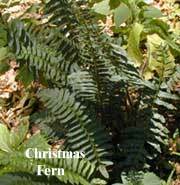 Christmas fern is seldom found in soils that are too waterlogged or that are too rocky. Christmas fern may grow in large, extensive colonial masses but more typically is found in clusters of two or three individuals. Growing ferns and the accumulated detritus of past sterile fronds form a dense covering mass over the soil surface. This mass helps to stabilize the underlying soil and prevent or lessen erosion. It also generates a protective, concealing habitat for a number of ground feeding and ground nesting bird species. Because of their complex chemical composition, ferns are eaten by very few browsers or grazers. Fern densities in general have been increasing in many of the forests of Pennsylvania due to the removal of competing, but more palatable, under-story plant species by the extensive browsing by the state's rapidly increasing deer population. This change in the forest under-story habitat structure has had wide-spread and deleterious impacts on the densities and successes of some mid-canopy birds (like the least flycatcher and the yellow billed cuckoo). Other bird species (like the wild turkey, for example) that use the concealing fern masses for their nesting sites have, however, increased in density in these "fern park" forests. In commercially grown Christmas ferns a fern scale insect and the mealy bug can extensively feed on and damage the plants. Also, the larvae of the pyralid moth (Herperogramma aeglealis) can construct a variety of feeding shelters within the sterile fronds of the Christmas fern and consume its terminal frond leaflets (probably before they accumulate significant levels of their protective chemicals).